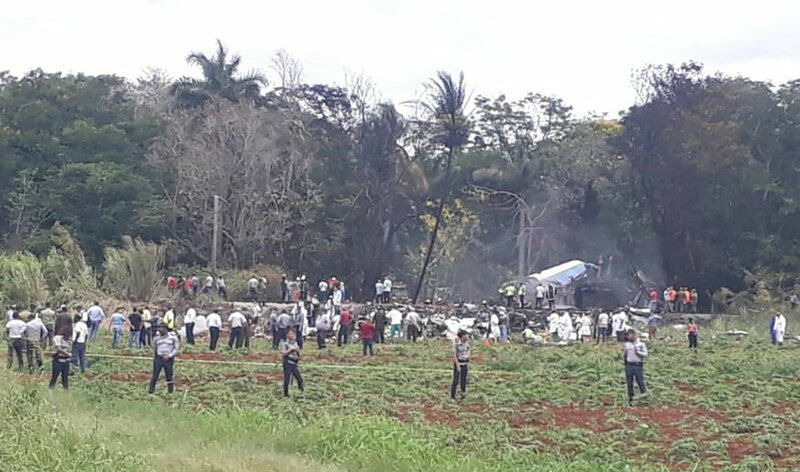 A Cuban-operated airliner with at least 110 people on board crashed into a yucca field just after takeoff from Havana’s international airport on Friday. There appeared to be mass casualties as Cuban officials said three people had survived, but had yet to give an official toll. Authorities said there were 104 passengers and nine foreign crew members on the flight, operated by Cubana de Aviacion. An employee of a Mexican charter firm said the plane belonged to the company and it had a six-person Mexican crew. Residents of the rural site of the crash a short distance from the end of the runway told The Associated Press they saw some survivors being taken away in ambulances, and a military officer who declined to provide his name said there were three survivors in critical condition from the Cubana airlines flight. State media also reported there were three survivors. Cuban officials did not explicitly say that everyone else on board had perished in the crash just after noon Friday. “My daughter is 24, my God, she’s only 24!” cried Beatriz Pantoja, whose daughter Leticia was on board the plane. Pantoja and other family members were rushed to a private area inside an airport terminal in the afternoon. An employee who answered the phone at the Mexico City office of Aerolinea Global Air said that the Mexican crew included a pilot and a co-pilot. The employee asked his name not be used as the company had not yet made a formal statement. Websites offering the firm’s services say it flies to Cuba and operates several 737 planes. Founded in 1990, the company operates under the legal name Aerolineas Damojh, SA de CV. Firefighters rushed to extinguish flames engulfing the Boeing 737, which was meant to be on a short jaunt to the eastern Cuban city of Holguin when it went down just after takeoff from Jose Marti International Airport. On Thursday, Cuban First Vice President Salvador Valdes Mesa met with Cubana officials to discuss improvements to its service. The airline is notorious for its frequent delays and cancellations, which Cubana blames on a lack of parts and airplanes due to the U.S. trade embargo on the island. 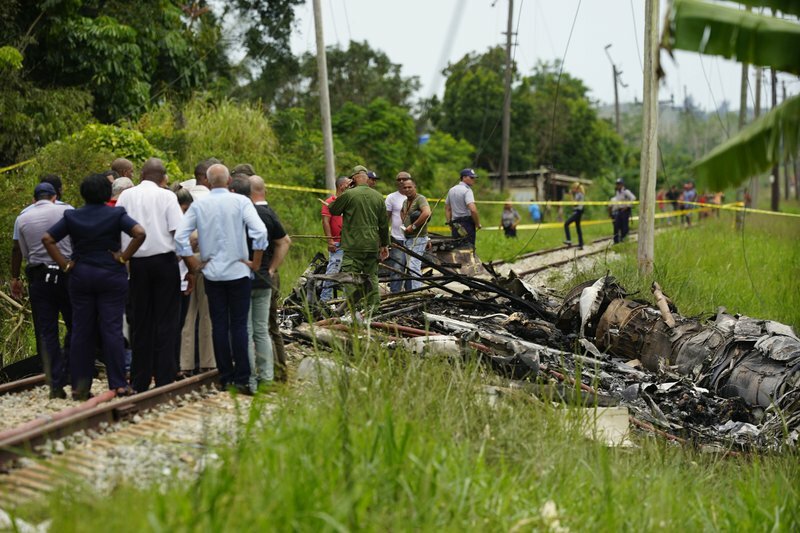 Last year a Cuban military plane crashed into a hillside in the western province of Artemisa, killing eight soldiers on board. In November 2010, an AeroCaribbean flight from Santiago to Havana went down in bad weather as it flew over central Cuba, killing all 68 people, including 28 foreigners, in what was the country’s worst air disaster in more than two decades. The last accident involving a Cubana-operated plane was on Sept. 4, 1989, when a charter flight from Havana to Milan, Italy, went down shortly after takeoff, killing all 126 people on board, as well as at least two dozen on the ground. Cubana’s director general, Capt. Hermes Hernandez Dumas, told state media last month that the airline’s domestic flights had carried 11,700 more passengers than planned between January and April 2018. It said 64 percent of flights took off on time, up from 59 percent the previous year.